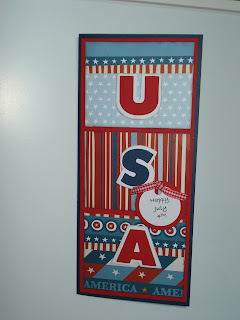 Smartcookie's Scrappy Spot: Happy 4th of July! Time for some creating! It seems that it has been so long since I have been able to do anything scrap/papercrafting related. I made these cards for a July Card Swap. The cardstock is Bazzil and I don't remember the pattern paper. The letters are Sizzix. I have every Cricut cart out there and I still drag out my trusted Sizzix all the time. You just can't give up on an old friend. Hope everyone has a safe and 'sane' 4th of July! This card turned out so great, Nancy. I just love it.